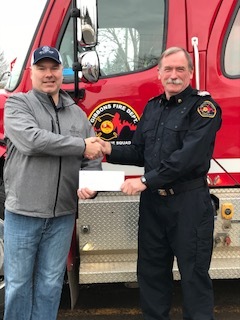 Gibbons Fire Department would like to recognize Alliance Pipeline who recently donated $5000 to be used to purchase 2 AFFRCS Radios for the Gibbons Fire Department to assist with communications on Multi Agency incidents. The Alberta First Responders Radio Communications System (AFRRCS) is a two-way radio network for first responders in municipal, provincial and First Nations agencies across the province. We received $4,000 which was used to purchase a smart board for our training room. We received funds to purchase additional radios for our members. We received $4,733.66 which was used to purchase the Jaws of Life that we currently carry on our rescue unit. These hydraulic rescue tools are frequently used to assist vehicle extrication of crash victims. The set of tools include a hydraulic pump, cutters, spreaders and a ram – all of which are extremely useful and versatile in helping us remove trapped patients when time is of the essence. We spent $4824.75 on Rescue 42 struts to assist us in many facets, the main priority being MVC’s. Prior to this purchase we would use a 6 foot long 4×4 that needed to be assembled into a metal plate with a ratchet strap. This process was long and tedious especially when time is of the essence. It wasn’t long before we were called out to an MVC and we were able to see the benefit first hand. A pickup truck had rear ended another pickup truck at full highway speed and was resting dangerously on what was left of the rear axle. We were able to deploy these struts in less than 2 minutes and stabilize the truck allowing us to extricate the 2 passengers safely. Our second priority was rope rescue equipment which we purchased for $4322.19. Gibbons is located adjacent to a beautiful ravine with the Sturgeon River flowing through the base. There are walking trails that wind throughout the forest as well as quad trails and tobogganing hills and it’s not rare to see canoes or kayaks in the water during the summer months. Since acquiring this equipment we have brought in an instructor to certify the fire department in low angle rescue. We see this as imperative, as some of the areas within the river valley could only be accessed by water or belay. Since we are not certified for water rescue we are now able to access potential victims from above with the use of ropes.